Based on a traditional Chinese drama from the 13th century, Snow in Midsummer draws an eerie, piercing picture of a community where a sense of being displaced seems to be looming under everybody’s surface. Displaced in culture, where westernised consumerism clashes with ancient superstitions, in climate, where the earth has become inhabitable by curse as much as by industrialisation, in love, where there’s precious little to hold on to, even in life, where the border between ghosts and the living is oh so fluid. A breath stopping production, serious, heart-breaking, with thrown in quips of humour, just before realisation hurts too much. 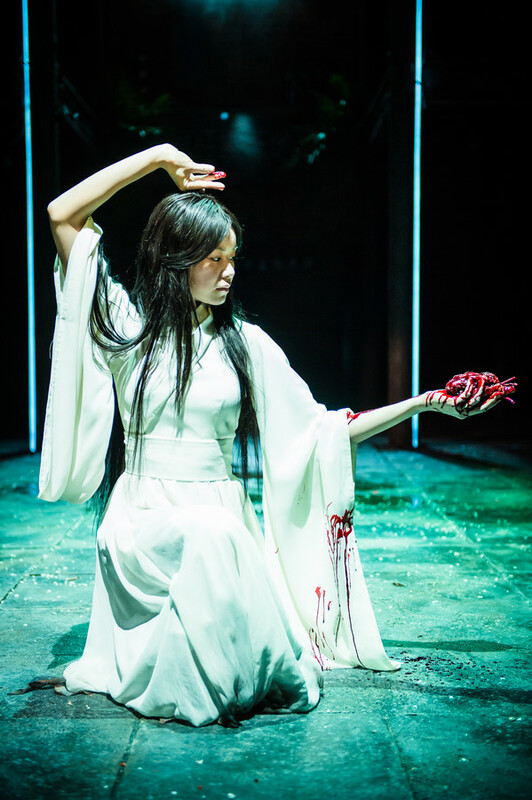 Katie Leung is Dou Yi, a young widow who is executed for a murder she didn’t commit. She plays her part with incredible strength, control and tenderness, encompassing a range of genres including horror and operatic pathos. Displaced in time and life, she puts her quest for justice in the hands of Tianyun, a businesswoman, and her young daughter Fei-Fei. Wendy Kweh delicately owns Tianyun’s hard-won balance between leadership attitude and vulnerability from suppressed emotions. 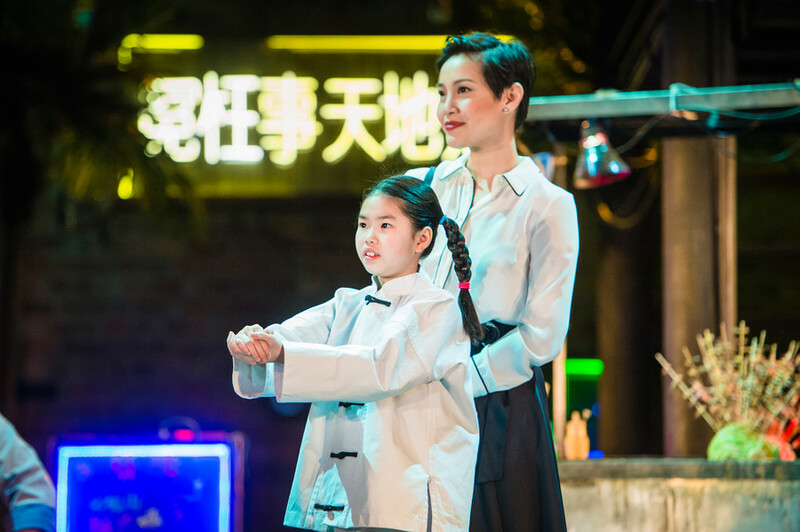 7-year-old Fei-Fei is alternatingly played by 3 extremely talented young girls. 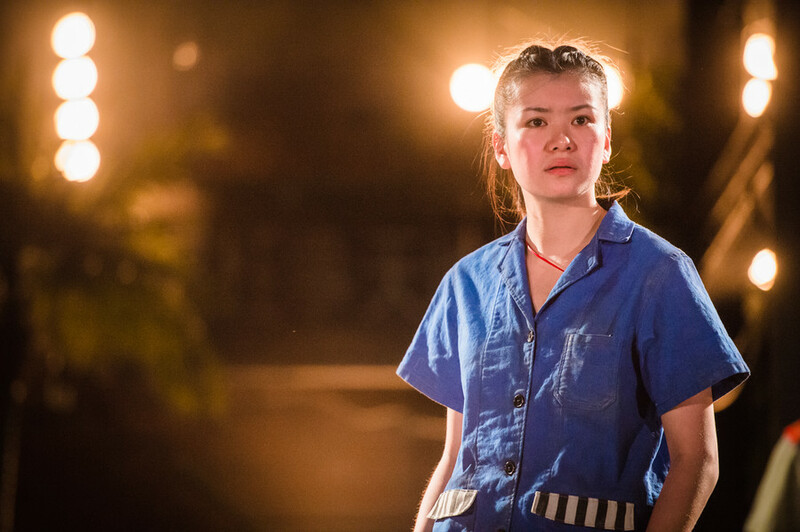 Certainly Emily Dao, whose turn it was on press night, excels in professional brilliance. The character of Handsome Zhang, son of Master Zhang, a local industrialist, is brought into remarkable light by Colin Ryan. Handsome’s struggle against his father’s expectations, his desperate fight for his love … this fine young actor owns the stage with his persona and he makes this difficult character immensely human. In the parts of Master Zhang and Doctor Lu, Daniel York shows great versatility. Amongst the female support acts, Jacqueline Chan leaves a deep impression as blind Mother Cai. Sarah Lam, as Handsome’s former wet nurse, builds up a clouded presence. 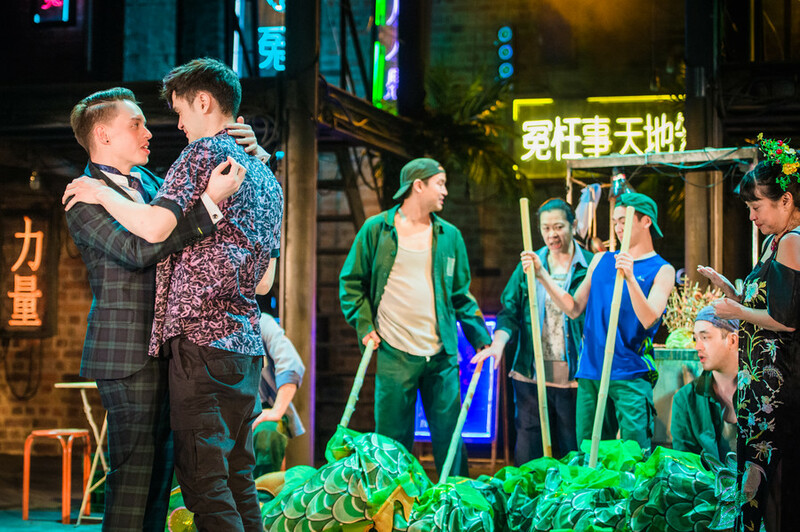 Snow in Midsummer is the result of the RSC’s Chinese Translations Project to support cultural exchange, astutely re-imagined by playwright Frances Ya-Chu Cowhig. Director Justin Audibert, yet again, succeeds in bringing together age old tradition and a supposedly “other” culture with universal and modern human experience. Masterly. Much kudos, too, to Ruth Chan for incredible music and Anna Watson’s ingenious lighting. This entry was posted in Theatre and tagged Andrew Koji, Andrew Leung, Colin Ryan, Daniel York, Emily Dao, Frances Ya-Chu Cowhig, Jacqueline Chan, Jonathan Raggett, Justin Audibert, Katie Leung, Kevin Shen, Lucy Sheen, Richard Rees, RSC, Sarah Lam, Sophie Wong, Stratford-upon-Avon, Swan Theatre, Wendy Kweh, Zoe Lim on March 6, 2017 by lingonews.